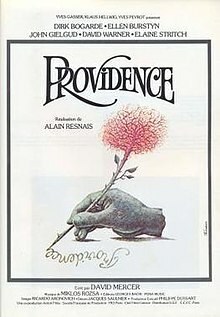 Providence is a 1977 French/Swiss film directed by Alain Resnais from a screenplay by David Mercer. It explores the processes of creativity through a portrayal of an ageing novelist, played by John Gielgud, who imagines scenes for his latest novel which draw upon his past history and his relationships with members of his family. The film won the 1978 César Award for Best Film. On the following day, Clive welcomes Claude, Sonia and Kevin (in reality an astrophysicist) for an idyllic birthday lunch in the sunlit garden of his country mansion, and their relationships are characterised by mutual affection and good humour, albeit with signs of self-restraint in deference to the occasion. After lunch, in what he seems to envisage as a final parting, Clive unexpectedly asks them all to leave without a word. John Gielgud as Clive Langham. Gielgud described his role as "a very tough, Augustus John kind of character, drunk half the time, lying in bed drinking white wine and throwing bottles about, and roaring a lot of very coarse dialogue." The producer Klaus Hellwig suggested to Resnais that he should make a film with the British playwright David Mercer. The two men met in London and, overcoming the obstacle that neither of them spoke the language of the other fluently, they began a series of discussions of drafts and redraftings which extended over a year. Mercer's original idea concerned the situation of political prisoners held in a sports stadium, symbolising a world in collapse. Gradually the outline shifted to the imagination of an aging writer seeking the material for a novel. Resnais proposed making the whole film into a metaphor of creation and disintegration; he also made extensive alterations to the chronology of the scenes as written by Mercer. The title of the film was also supplied by the producer, signifying both the name of the estate where the ageing novelist lives and also the controlling hand with which he arranges the fate of his characters. The name evoked further associations with the American city of Providence, the home of the fantasy writer H. P. Lovecraft whose gothic stories inspired some of the imagery in the film. The original intention was to shoot the film in the United States in New England but for reasons of cost this became impracticable. Certain exterior scenes were filmed in Providence and in Albany in the US, while others were done in Brussels, Antwerp, and Louvain; these were used in conjunction with each other to form a composite cityscape for the background of certain scenes. Studio scenes were filmed in Paris. The final birthday party sequence was shot on location at the château de Montméry at Ambazac near Limoges. Filming took place between April and June 1976. The set designs were created by Jacques Saulnier, a regular collaborator with Resnais, and he won a César award for his work. In order to create a funereal atmosphere, grey and dark shades predominated in the design and strong colours were excluded. Saulnier recalled that Resnais made him read H.P. Lovecraft in order to imbue Langham's house with the presence of death: "I imagined it like a family tomb". In some scenes (created in Clive Langham's imagination) the layout of a set changes between one shot and another (for instance, the door in the corner of a room in one shot appears at the bottom of a flight of stairs in another; a conversation between four characters alone in one scene continues in the midst of a party in the next). Some settings use a painted backdrop which has a deliberately theatrical appearance; one of them portrays a seascape in which artificial waves surge up among the painted rocks (achieved by blowing bursts of polystyrene foam pieces from beneath the set). Providence was Alain Resnais's first film in English, and a prestigious cast of British and American actors was engaged despite the restrictions on the budget. Resnais held a longstanding ambition to cast John Gielgud in a substantial film role, having seen him performing on stage, and was encouraged to approach him by Dirk Bogarde. Gielgud later described the project as "by far the most exciting film I have ever made", and noted the impressive calmness of Resnais throughout filming which made him "wonderful to work with". He also recalled the contribution made by Florence Malraux, Resnais's wife, who spoke fluent English and helped overcome the director's limitations in that respect. Resnais attached great importance to the interplay of vocal timbres of his principal actors, and he described how he thought of them as a Schubertian quintet: Ellen Burstyn a violin, Dirk Bogarde a piano, David Warner a viola, John Gielgud a cello, and Elaine Stritch a double bass. The original intention had been to make the film in French, translating it from the English. Resnais however soon felt that it wouldn't work in French: "I could hear it so clearly in English and anyway, Mercer's writing depended on the English inflection." The producers agreed, but insisted that there should also be a French version." The process of dubbing the completed work into French was undertaken with particular care: the voice actors included Claude Dauphin as Clive, François Périer as Claude, Gérard Depardieu as Kevin, Nelly Borgeaud as Sonia, and Suzanne Flon as Helen. For the music Resnais turned to the Hungarian-born Hollywood composer Miklós Rózsa, whom he had admired especially for his work on the 1949 version of Madame Bovary. Rózsa later cited Resnais as one of the few directors in his experience who really understood the function of music in film. Soundtrack albums were eventually issued on LP and CD. Resnais described the film as a "macabre divertissement", insisting that he wanted it to be funny despite the darkness of its themes. He also said that one of the questions which the film poses is whether we are the people we think we are or whether we become what others make of us in their judgments. A central theme is the process of artistic creation: "[Providence] is a meta-film, a film about the making of films, a work of art about the fabricating of art works." Expanding this idea: "The film suggests some symbiotic relation between creator and created script.... The characters are [Clive's] creations, yet he speaks to them as if they were wilful children. Their status is ambiguous since they a composite: they are dream figures, created characters and also individuals who are part of Clive's proximate reality." In counterpoint with creativity, the theme of death recurs constantly, not so much as a subject in itself but in Clive's struggle to avoid it: Resnais described the film as telling the story of the old writer's determination not to die, and his continual drinking and imagining are the evidence of his refusal to let go. As well as the funereal aspects of the decor and the scenes of autopsy, the repeated instances of metamorphosis of a character into a werewolf is linked to the advent of death, with the implication that the process of dying reduces man to animal. Clive also has an obsession that the young are trying to push him aside, to kill him, which he visualises in the scenes of the stadium/concentration camp where the old are rounded up by soldiers who are all young. Other motifs which contribute to the mood of morbid anxiety are the military search parties and images of deportation, the helicopter surveillance, the sound of bombs and ambulance sirens, and the demolition of buildings. As several writers about the film have observed, the opening sequence mirrors the beginning of Citizen Kane: the plaque outside the house, the camera closing in on a lighted doorway, the breaking of a glass object, the close-up of the lips of Clive as he curses. Whereas the personality of Kane is explored through the separate 'versions' of people who knew him, in Providence it is the central figure of Clive who draws the characters of the members of his family and gives a reflection of himself through them. One of the thoughts on his own style of expression which was written for the character of Clive by David Mercer has been noted by many critics as especially applicable to Resnais himself. Citing a criticism of his own creative work that the pursuit of style has often resulted in a lack of feeling, Clive then argues back that "Style is feeling—in its most elegant and economic expression." In France the press response to Providence at the time of its release (and again at its re-release in 1983) was overwhelmingly enthusiastic. Many argued that it was a film of great cultural importance, and a highlight in Resnais's career. The film went on to win seven prizes at the César awards, including Best Film and Best Director. By contrast, reviewers in the United States were predominantly hostile to the film. Vincent Canby in The New York Times called it a "disastrously ill-chosen comedy" and "a lot of fuss and fake feathers about nothing"; he found the script pretentious and the structure complicated without being complex. For John Simon in the New York magazine it was an "unmitigated disaster" in which he criticised almost every aspect with the exception of John Gielgud's performance. Pauline Kael wrote a 2000 word review in The New Yorker which found fault with the contradictory structure, the stilted language, the artificiality of the acting, and the glacial directorial style of the film before concluding that all it amounted to was "the pain of a 'clever' English play". A short notice in Variety took a different view, referring to "an unusual visual tour-de-force ... offering dense insights into the flights of imagination of a supposedly dying writer". In the UK, the film received a more varied reception, and it had a successful box-office run in London. David Robinson writing in The Times was troubled by the quality of the writing: "Resnais's visual creations ... seem very flimsily supported on the frame of David Mercer's script ... the writing, again, is self-conscious, stiffly literary. The dialogue is formal, and artificial ... And the pretensions of the text only increase suspicion that it is not about very much at all." A non-judgmental review in the Monthly Film Bulletin emphasised the many layers of thematic cross-reference both within the film and beyond it, with echoes of other work written by David Mercer and elements from other films as well as the occasional interleaving of European and American landscapes. Gilbert Adair in Sight & Sound contrasted David Mercer's excessively literal script in which "nothing is left unstated" with the extent of the personal mythology and fantasy which Resnais was able to introduce into the film; he found the work enriched by its anti-naturalistic devices such as the gaffes in continuity which emerge in Clive's plotting of his novel and the exchange of voices of the characters, as well as by the disjunctive appearances of a clownish footballer in inappropriate scenes; and despite certain reservations he concluded that "the dream cast perform together superbly". A specific criticism of one aspect of the film appeared in a comment column of the British Medical Journal, where it was argued that the inclusion of scenes of a post-mortem on a corpse (accurate but unsparing) was "undignified and uncivilised and ought to be condemned" because the audience was not prepared for them and they were unnecessary to the plot. Retrospective evaluations of Providence have generally been more positive than the contemporary ones. In the Oxford History of World Cinema it is described as "a magisterial and deeply moving incursion into the fantasies of a dying man". For the critic Jonathan Rosenbaum, "The superb performances and Miklós Rózsa's sumptuous Hollywood-style score give the film's conceit a moving monumentality and depth, and Resnais' insights into the fiction-making process are mesmerising and beautiful." The artist Tacita Dean cited Providence as her favourite film, saying that "it deals effortlessly with the problems of enacting the fantasies of a writer’s imagination. It mixes places and time within single sequences to create an uncanny sense of dislocation but its brilliance is its leanness – not a single moment of excess." The second part of the film supplements the first by altering its effect, by denying its sometimes hostile paranoid proof but not by eradicating these altogether. The parts of the film open Providence up as a series of reflecting realities which, wound together, may offer something of the hesitance and doubt of mental process. In this sense, Providence may be seen as a precursor to the work of David Lynch in films such as Lost Highway (1997) and Mulholland Drive (2001). ^ a b John Gielgud, An Actor and His Time. London: Sidgwick & Jackson, 1989 (revised edition). pp. 195–198. ^ "Entretien avec David Mercer", in Robert Benayoun, Alain Resnais: arpenteur de l'imaginaire. Paris: Éditions Ramsay, 2008. pp. 275–277; also p. 159. ^ "Entretien avec Alain Resnais sur Providence", in Robert Benayoun, Alain Resnais: arpenteur de l'imaginaire. Paris: Éditions Ramsay, 2008. pp. 228; 240–241. ^ Robert Benayoun, Alain Resnais: arpenteur de l'imaginaire. Paris: Éditions Ramsay, 2008. pp. 238, 299. ^ Le Populaire, 02/03/2014. Retrieved 10 August 2014. ^ Jacques Saulnier, in Jean-Luc Douin, Alain Resnais. Paris: Éditions de la Martinière, 2013. pp. 256–257. ^ Suzanne Liandrat-Guigues, Jean-Louis Leutrat. Alain Resnais, liaisons secrètes, accords vagabonds. Paris: Cahiers du Cinéma, 2006. p. 91. ^ Jacques Saulnier interviewed in À propos de Providence, film documentary accompanying the DVD of Providence issued by Edition Jupiter in 2013. ^ Jean Regazzi, Le roman dans le cinéma: retour à Providence. Paris: L'Harmattan, 2010. p. 175. ^ Suzanne Liandrat-Guigues, Jean-Louis Leutrat. Alain Resnais, liaisons secrètes, accords vagabonds. Paris: Cahiers du Cinéma, 2006. pp. 232–233. ^ Alain Resnais, in an interview accompanying the DVD of Providence issued by Edition Jupiter in 2013. ^ Nicholas Wapshott. "Resnais's continuing capacity to surprise" [interview], in The Times, 17 November 1980, p.10: "But later [the producers] came back to us and said that in New York the fact that it would be in English counted against the film. They prefer their European films to be in a foreign language with sub-titles. I suggested that we should send the dubbed French version to New York with English sub-titles." ^ "Entretien avec Alain Resnais sur Providence", in Robert Benayoun, Alain Resnais: arpenteur de l'imaginaire. Paris: Éditions Ramsay, 2008. p. 236: "j'espère que ce film est drôle car je le vois comme un divertissement, macabre certes et noir, mais un divertissement tout de même". ^ "Entretien avec Alain Resnais sur Providence", in Robert Benayoun, Alain Resnais: arpenteur de l'imaginaire. Paris: Éditions Ramsay, 2008. p. 228: "L'une des questions que pose le film est, si vous voulez, celle-ci: est-ce que nous sommes ce que nous pensons être, ou est-ce que nous devenons ce que les autres font de nous dans leurs jugements?" ^ William F. Van Wert. "Meta-film and point of view: Alain Resnais' Providence", in Sight & Sound, Summer 1979, p.179. ^ Emma Wilson. Alain Resnais. Manchester University Press, 2006. p. 135. ^ a b "Entretien avec Alain Resnais sur Providence", in Robert Benayoun, Alain Resnais: arpenteur de l'imaginaire. Paris: Éditions Ramsay, 2008. p. 229. ^ Gerald Weales. Review of Providence, in Film Quarterly, vol.30 (4), Summer 1987, pp. 21–24. ^ Emma Wilson. Alain Resnais. Manchester University Press, 2006. p. 133. ^ a b Gilbert Adair, "Providence [review]", in Sight & Sound, March 1977, pp. 120–121. ^ Jean-Luc Douin, Alain Resnais. Paris: Éditions de la Martinière, 2013. p. 121. ^ a b David Robinson. "Events of a sleepless night" [review], in The Times, 12 May 1978, p.9. ^ a b c Richard Combs, in Monthly Film Bulletin, March 1978. pp. 51–52. ^ "Entretien avec David Mercer", in Robert Benayoun, Alain Resnais: arpenteur de l'imaginaire. Paris: Éditions Ramsay, 2008. p. 277-278. ^ Jean Regazzi, Le roman dans le cinéma: retour à Providence. Paris: L'Harmattan, 2010. pp. 191–192, quotes the following: Robert Chazal, France Soir, 10/2/1977: "du très grand art"; "un chef d'œuvre"; France Nouvelle, 31/1/1977: "un très grand évènement"; Michel Mohrt, Le Figaro, 19/2/1977: "une œuvre maitresse"; La Républicain lorain, 8/2/1977: "Un sommet du cinéma"; Alain Rémond, Télérama, 9/2/1977: "Providence, c'est le Resnais de la grande époque"; Le Quotidien de Paris, 15/2/1977: "Lauriers pour Alain Resnais". ^ Palmarès: Providence, at l'Académie des Arts et Techniques du Cinéma. Retrieved 17 August 2014. ^ Obituary of Alain Resnais by Tim Page, in The Washington Post, 3 March 2014. Retrieved 8 August 2014. ^ Providence: review by Vincent Canby, in The New York Times, 26 January 1977. Retrieved 16 August 2014. ^ John Simon. "Providence: improvident, imprudent, impossible", in New York magazine, 31 Jan 1977. p. 70. ^ a b Paul Kael, "Werewolf, mon amour", in The New Yorker, 31 January 1977, pp. 70–72. ^ Review: Providence, in Variety, 31 December 1976. Retrieved 17 August 2014. ^ Interview with Jonathan Rosenbaum: A Lesson in Modesty: Speaking with Alain Resnais, in Soho News, 23 December 1980. Retrieved 18 August 2014. ^ "Medicine in the Media", in British Medical Journal, 1 July 1978, pp. 48–49. ^ David Thomson. The New Biographical Dictionary of Film. London: Little, Brown, 2002. p. 730: "Providence grows as time passes". ^ Peter Graham, "New directions in French cinema", in The Oxford History of World Cinema; edited by Geoffrey Nowell-Smith. Oxford: Oxford University Press, 1996. ^ Jonathan Rosenbaum, Providence, in Chicago Reader, 26 October 2000. Retrieved 17 August 2014. ^ Tacita Dean, in Sight & Sound 2012 Greatest Films Poll. Retrieved 17 August 2014. ^ Jean Regazzi, Le roman dans le cinéma: retour à Providence. Paris: L'Harmattan, 2010. p. 191. Quotes the objection thus: "une déplorable concession au cinéma conventionnel, le reniement petit-bourgeois et consensuel de toutes les audaces expérimentales des quatre cinquièmes du film...."
^ Jean Regazzi, Le roman dans le cinéma: retour à Providence. Paris: L'Harmattan, 2010. p. 195. ^ Emma Wilson. Alain Resnais. Manchester University Press, 2006. p. 138. This page was last edited on 6 April 2019, at 10:06 (UTC).